Polioviruses were the most common cause of asymmetric acute flaccid paralysis (AFP) in India. After mass vaccination campaigns, polio has declined from a hyperendemic to a near polio-free status with the last known case in 13 January 2011. It is hoped that by 2014 India will be free from wild polio virus transmission. However, emerging threats such as West Nile virus (WNV) lurk and often affect adults unlike polio, which mainly afflicts children. WNV came into prominence after an outbreak in New York city in 1999. Phylogenetically there are five lineages of WNV (1-5). The most important neuropathogen is lineage 1 (Clade 1a). Lineage 1 (Clade 1b) and lineage 2 cause self-limiting illnesses. The other lineages are less well characterized. It is noteworthy that WNV of genetic lineage 1 Clade 1a was isolated from an outbreak of encephalitis in Alappuzha, Kerala in 2013. However, AFP due to WNV has not been adequately characterized. We describe the first cases of laboratory confirmed WNV associated AFP in India. A 55-year-old man developed fever of 1 week duration, followed by altered sensorium of 1 day duration. On admission, he had neck rigidity with intermittent opisthotonus. Computed tomography brain and routine blood investigations were normal. He developed hypotension after admission and required intubation and vasopressors. Cerebrospinal fluid (CSF) showed 700 cells/cmm with 43% polymorphs, 57% lymphocytes, normal sugar and elevated protein of 75 mg/dl. He was started on ceftazidime, vancomycin and acyclovir. After 2 days, his condition deteriorated. On examination, he was in a "locked in state" (conscious, opened eyes and blinked and tracked his eyes and protruded his tongue to command). He had a flaccid quadriplegia with grade 0 power in all limbs and global are flexia. Sensory examination was normal. Magnetic resonance imaging (MRI) spine showed hyperintensities in the cervical cord extending from C2 to C7 levels. Axial MRI sections showed intense hyperintensities predominantly involving the grey matter (polio-myelitis) [Figure 1]. MRI brain was essentially normal. His chest X-ray showed bilateral fluffy infiltrates. He then developed intermittent dysautonomia with intermittent tachycardia, tachypnea, blood pressure swings and hypersalivation. Nerve conduction (NCV) studies showed normal motor and sensory responses with absent F waves in all nerves. The initial diagnosis was AFP with polyradiculopathy due to a meningo-encephalitis. 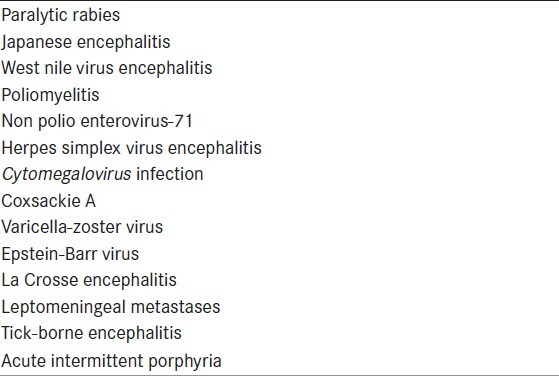 The differential diagnosis included paralytic rabies, Cytomegalovirus (CMV), human immunodeficiency virus (HIV) infection and leptomeningeal metastases [Table 1]. On day 5, he developed oliguric renal failure and persistent hypotension following which he became comatose. CSF polymerase chain reaction (PCR) panel was positive for WNV and negative for CMV, human herpes virus-6, rabies, John Cunningham virus, herpes simplex virus (HSV) 1 and 2, dengue, Japanese encephalitis (JE), nipah, chikungunya, chandipura, mumps, measles and enterovirus including poliovirus, fungi and bacteria including Myobacterium tuberculosis on day 7 (Xcyton acute encephalitis syndrome [AES], Bangalore). The serum and CSF samples were positive for both Japanese encephalitis virus (JEV) and WNV immunoglobulin M (IgM) antibodies by IgM capture enzyme-linked immunosorbent assay (ELISA) (JEV IgM ELISA, National Institute of Virology [NIV] Pune and WNV IgM ELISA, InBiosinc. USA). However, the serum sample on microneutralization assay showed a high titer of neutralizing antibodies to WNV (titer: 40) and undetectable neutralizing antibodies to JEV (titer <10). Hence, the WNV etiology was confirmed. CSF was negative for malignant cells. He was offered sustained low efficiency dialysis (SLED) due to persistent hypotension. He underwent three sessions of SLED. On day 14, the relatives decided to withdraw treatment and he expired on day 15. A 42-year-old man presented to us with buttock pain of 1 week duration. Two days prior to admission, he developed high grade fever and back pain followed the next day by weakness of the right leg and intense twitching of the right thigh. He had grade 0/5 power in the right leg, 4/5 power in the left leg with absent deep tendon reflexes bilaterally and a normal sensory exam. Fasciculations were noticed over both thighs. An MRI spine with contrast was normal. Routine blood investigations were normal. CSF showed 135 cells with 93% lymphocytes and 7% polymorphs and normal sugar and protein. PCR for bacteria, including Mycobacterium tuberculosis, Streptococcus pneumonia, Neisseria More Details meningitidis and HSV, CMV and varicella zoster virus were negative. He was treated for presumptive viral myelitis with acyclovir, ceftazidime and vancomycin for 10 days. Three serum samples collected within 2 weeks after the onset of central nervous system (CNS) symptoms were positive for both JEV and WNV IgM antibodies by IgM capture ELISA (JEV IgM ELISA, NIV Pune and WNV IgM ELISA, InBiosinc., USA). However, the serum samples on microneutralization assay showed significantly high titre of neutralizing antibodies to WNV (titre: 320) and undetectable neutralizing antibodies to JEV (titer <10) confirming the WNV etiology. His fever subsided, but he had residual flaccid paralysis of the right leg, proximal > distal at follow up 1 month later. A 45-year-old man presented to us with high grade fever of 5 days duration, generalized weakness, twitching of both thighs and difficulty in walking of 1 day duration. He had grade 3 power in the right hip flexion and knee extension, absent deep tendon reflexes in both lower limbs and generalized fasciculations all over the body, including the facial muscles. Sensory examination was normal. MRI spine showed an ill-defined non-enhancing hyperintensity in the cervico-thoracic cord. CSF showed 246 cells, 80% polymorphs and 20% lymphocytes, with normal sugar and protein. CSF PCR panel for multiple organisms including WNV was negative. Routine blood investigations including erythrocyte sedimentation rate were normal. He was treated with acyclovir and antibiotics and made a near complete recovery. At follow up 3 weeks later, he complained with severe fatigue and occasional buckling at the right knee. The serum and CSF samples were positive for both JEV and WNV IgM antibodies by IgM capture ELISA (JEV IgM ELISA, NIV Pune and WNV IgM ELISA, InBiosinc. USA). However, the serum samples (three samples collected within 2 weeks of onset of CNS symptoms) on micro-neutralization assay showed significantly high titer of neutralizing antibodies to WNV (titer: 320) and undetectable neutralizing antibodies to JEV (titer <10) confirming the WNV etiology. Demographics are shown in [Table 2]. WNV infection is usually asymptomatic or results in a non-specific viral fever. One in 140 individuals go on to develop neuroinvasive WNV infection, often a non-specific menigoencephalitis. A small percentage of patients develop AFP. Clues to the anterior horn cell involvement include fasciculations at the onset in the involved muscles. WNV can produce AFP; monoplegia, diplegia, triplegia or quadriplegia with occasional brainstem involvement and respiratory failure. The sensory system is usually spared, although bowel and bladder function can be involved. Rare presentations include polyradiculitis (Guillain-Barre like syndrome [GBS]), brachial plexus (brachial plexitis) or dysautonomia due to involvement of the sympathetic neurons. Recovery from AFP is usually incomplete. On NCV studies, motor compound muscle action potential amplitudes are reduced and sensory nerve action potentials are spared. Electromyogram may show denervation. CSF usually shows >200 cells/cmm with normal sugars and increased protein levels. An initial neutrophilic leukocytosis is followed by lymphocytic predominance. The finding of CSF pleocytosis differentiates WNV polyradiculitis from GBS and should prompt consideration of WNV, CMV, HIV, sarcoidosis or leptomeningeal metastases. All our cases of WNV associated AFP reported in the month of May 2013 were spatially and temporally clustered and correlated with the pre-monsoon period of JEV/WNV seasonality in Kerala. 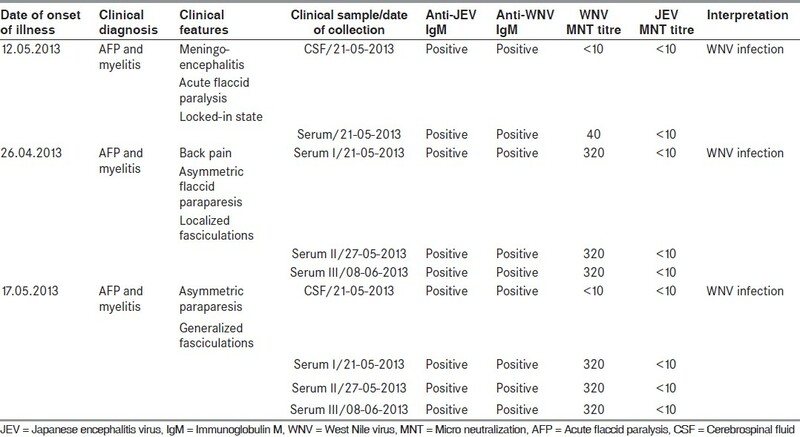 In the wake of reports of neurotropic WNV lineage 1 (Clade 1a) from Kerala, it is important to differentiate JEV and WNV infections in AES cases. Further, in the post-polio eradication era it may be worthwhile testing AFP cases for WNV. A high level of clinical suspicion, active clinical case detection and appropriate laboratory confirmation is the way forward to increase the hospital based surveillance of WNV infection in India. The virological part of the work was supported by the Indian Council of Medical Research grant of Dr. G. Arunkumar (File No. 5/8/7/15/2010/ECD-I and VIR/41/2010-ECD-I). 1. John TJ, Vashishtha VM. Eradicating poliomyelitis: India′s journey from hyperendemic to polio-free status. Indian J Med Res 2013;137:881-94. 2. Centers for Disease Control and Prevention (CDC). Outbreak of West Nile-like viral encephalitis - New York, 1999. MMWR Morb Mortal Wkly Rep 1999;48:845-9. 3. Balakrishnan A, Butte DK, Jadhav SM. Complete genome sequence of West Nile virus isolated from Alappuzha district, Kerala, India. Genome Announc 2013;1:230-13. 4. Davis LE, DeBiasi R, Goade DE, Haaland KY, Harrington JA, Harnar JB, et al. West Nile virus neuroinvasive disease. Ann Neurol 2006;60:286-300. 5. Iwamoto M, Jernigan DB, Guasch A, Trepka MJ, Blackmore CG, Hellinger WC, et al. Transmission of West Nile virus from an organ donor to four transplant recipients. N Engl J Med 2003;348:2196-203. 6. Biggerstaff BJ, Petersen LR. Estimated risk of transmission of the West Nile virus through blood transfusion in the US, 2002. Transfusion 2003;43:1007-17. 7. Paramasivan R, Mishra AC, Mourya DT. West Nile virus: The Indian scenario. Indian J Med Res 2003;118:101-8. 8. George S, Gourie-Devi M, Rao JA, Prasad SR, Pavri KM. Isolation of West Nile virus from the brains of children who had died of encephalitis. Bull World Health Organ 1984;62:879-82. 9. Petersen LR, Carson PJ, Biggerstaff BJ, Custer B, Borchardt SM, Busch MP. Estimated cumulative incidence of West Nile virus infection in US adults, 1999-2010. Epidemiol Infect 2012;28:1-5. 10. Kalil AC, Devetten MP, Singh S, Lesiak B, Poage DP, Bargenquast K, et al. Use of interferon-alpha in patients with West Nile encephalitis: Report of 2 cases. Clin Infect Dis 2005;40:764-6. 11. Jeha LE, Sila CA, Lederman RJ, Prayson RA, Isada CM, Gordon SM. West Nile virus infection: A new acute paralytic illness. Neurology 2003;61:55-9. 12. Leis AA, Stokic DS. Neuromuscular manifestations of West Nile virus infection. Front Neurol 2012;3:37. 13. 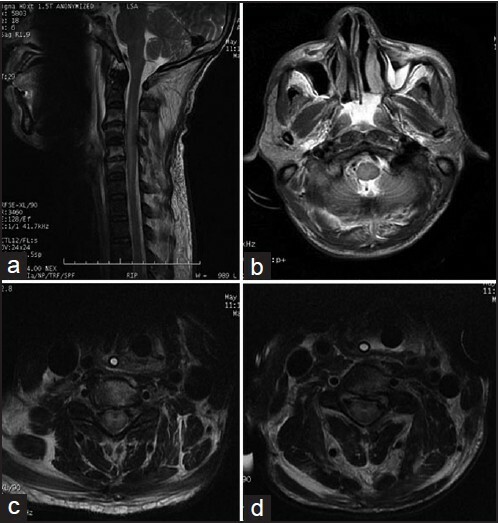 Ali M, Safriel Y, Sohi J, Llave A, Weathers S. West Nile virus infection: MR imaging findings in the nervous system. AJNR Am J Neuroradiol 2005;26:289-97. 14. Park M, Hui JS, Bartt RE. Acute anterior radiculitis associated with West Nile virus infection. J Neurol Neurosurg Psychiatry 2003;74:823-5. 15. Busch MP, Kleinman SH, Tobler LH, Kamel HT, Norris PJ, Walsh I, et al. 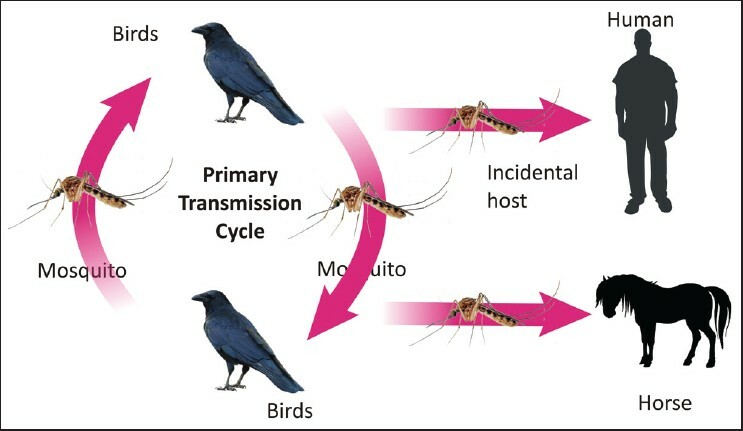 Virus and antibody dynamics in acute West Nile virus infection. J Infect Dis 2008;198:984-93. 16. Anderson JF, Rahal JJ. Efficacy of interferon alpha-2b and ribavirin against West Nile virus in vitro. Emerg Infect Dis 2002;8:107-8.